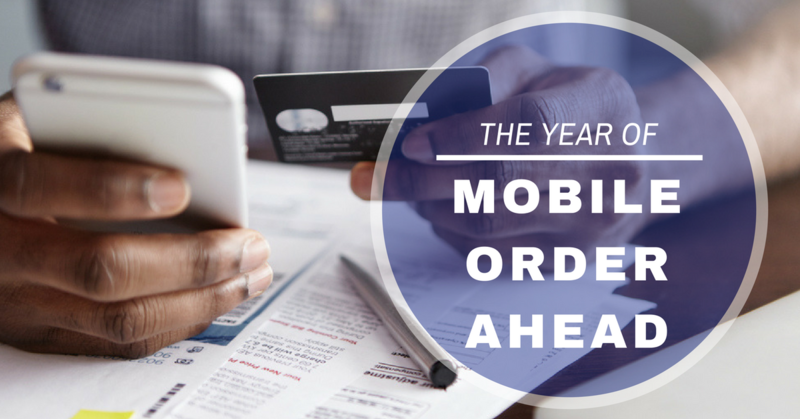 Mobile order ahead grew significantly in 2017 and that growth spurt will continue into 2018. As the QSR space continues to embrace this trend, more options will become available to consumers. Mobile order-ahead is projected to be a $38 billion industry within the next two years. That would put the trend at almost 11% of total QSR industry sales, a rally certainly influenced by the success of businesses that have already employed the order ahead strategy. Starbucks is a tremendous example of this success, with 10% of transactions originating from mobile-order ahead. Mobile order ahead comes in a few flavors as it exists today. In the case of Starbucks, users can order (and pay) ahead on mobile and skip the line once they arrive at the physical store. This streamlined ordering option makes it well worth it to consumers who value convenience and are looking to shave time off of everyday purchases. It’s simply easy to put an order in, and even easier to carry that order out. Order ahead extends beyond QSRs and has gained some momentum at big box retailers, especially this past holiday season. Many stores extended online ordering very late into the holiday season – butting up against Christmas eve – allowing customers to pick up their ordered items on the same day. It’s a mutually beneficial arrangement for retailers who can forego expensive shipping costs by enabling customers to easily pick-up pre-purchased items in-store. Grocery stores have also opted into this system, enabling consumers to order their groceries from home or the office and pick-up curbside for ultimate convenience. What’s more, consumers get to avoid delivery fees, lines, and the time-consuming task of browsing the aisles. Mobile order ahead is the tip of the iceberg and will expand into other realms as the Internet of Things (IoT) widens. This has already happened with digital/voice assistants. Consumers can now easily order for pickup from their favorite pizza place via a simple conversation with Amazon Echo. The landscape for order ahead only broadens from here – additional connected devices (cars, t.v.s, social messaging apps) will offer additional ways to order ahead and pay, all from the convenience of wherever a consumer happens to be. Order ahead options will continue to become more sophisticated, too. Right now, we are seeing a focus on maximum convenience for both consumers and retailers. There are other benefits for both parties that some merchants have already started to explore, including branding and loyalty. Starbucks has been a frontrunner in the loyalty game, offering extremely convenient ordering, payment, and rewards via the Starbucks app. Domino’s has taken a page from that book and offers the option for users to set up a Pizza Profile for saving “easy orders” and earning rewards points that can be redeemed for free pizza. It’s an easy sell for consumers who are willing to opt-in for free food and treats. It’s hard to dispute the efficacy of the mobile order ahead frenzy. For consumers, it means added convenience, reward points earned, and time saved. For merchants, it’s a significant bump to the bottom line. Consumers that pick-up in-store tend to add more items to their tab and spend more. Additionally, it streamlines the checkout process and enables merchants to process more customers than the normal order and checkout lanes in-store. The extra sales made possible by this efficiency can be significant in both the short- and long-term. While order ahead will continue to evolve, it’s established solid rationale – and use cases – for rapid adoption by merchants who haven’t already jumped on board. As the things from which consumers can order (wearables, cars, appliances, and devices) increases, their propensity to take advantage will as well.